Grace Brethren ministry leaders from the eastern region of the U.S. and Canada are gathered this week at Ocean City, Md., for the annual East Focus Retreat. 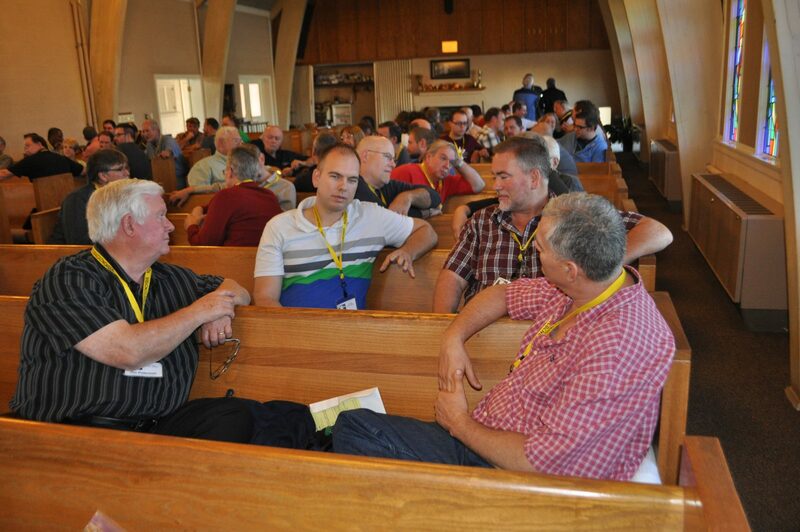 A record 98 pastors, staff members, and other leaders are registered for the two day event. This retreat, as was the Central Focus Retreat two weeks ago in Ohio, is launching the Identity Initiative in the Fellowship of Grace Brethren Churches. Originally scheduled to be held at the Holiday Inn Hotel and Suites, sessions are being held at a church several blocks from the hotel, where retreat participants are staying. Dave Guiles, executive director of Encompass World Partners, is leading the retreat, assisted by Bartley Sawatsky, pastor of Grace Community Church in Mississauga, Ontario. With an emphasis on relationship building, the first session addressed “Why We Care” and focused on open, cross-generational dialogue about “why we belong to the FGBC tribe, and what we value in our tribe.” Those questions, along with a discussion of “our hopes and fears as we move together into the future,” were shared in small groups. After dinner, each generation had the opportunity to listen to each other’s stories. Participants broke into groups of three, with each person representing a young, middle, and mature generation. They spread throughout the hotel to listen to each other’s stories. Thoughts and impressions from the two days are being captured on the FGBC Identity Wall at graceconnect.us. You may also follow the hashtag “FGBCidentity” and “FocusEast” on Twitter, Instagram, and Facebook. Photos are also be posted on the graceconnectus Facebook page.